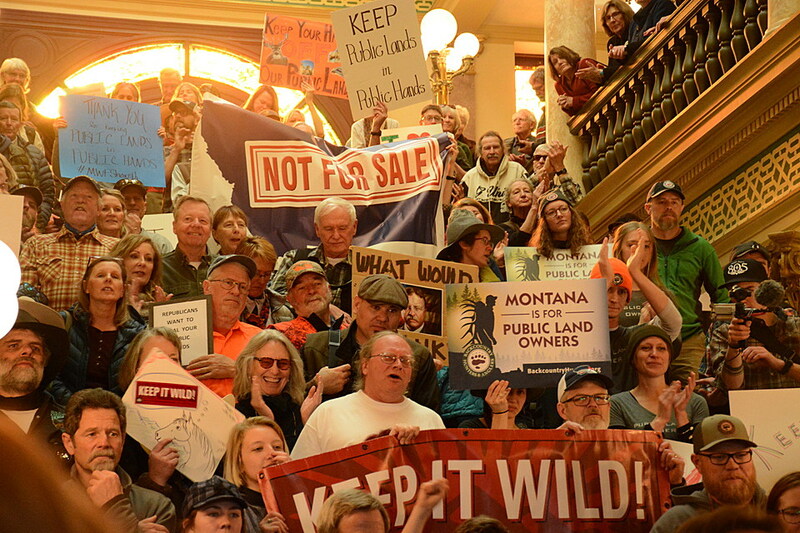 On Friday, hundreds of Montanans converged on the Capitol to participate in a rally supporting public lands. 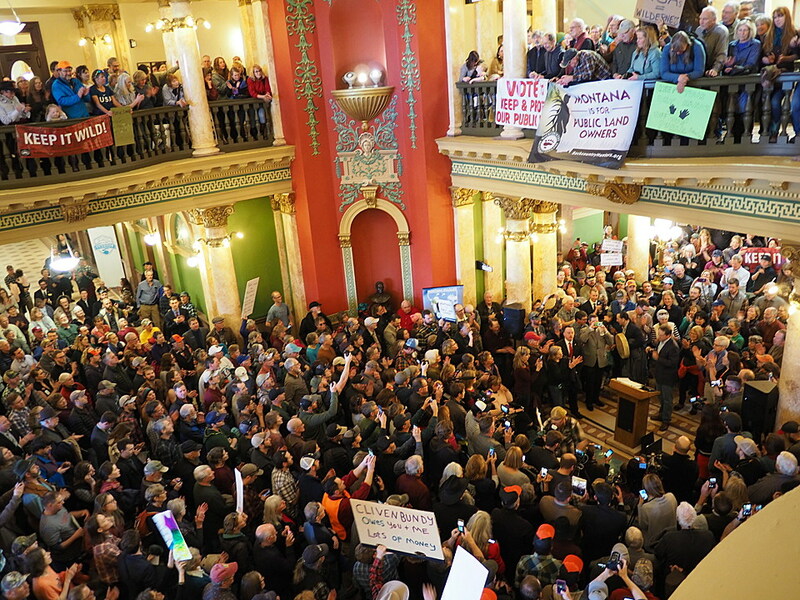 Busloads of people from Missoula, Great Falls, Bozeman, Butte and Billings joined others from smaller towns who packed into and above the rotunda where six advocates readied their praises of public lands. 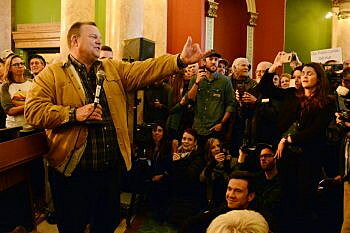 Emcee Mary Hollow of Prickly Pear Land Trust led the chant before Sen. Jon Tester took the mic and bellowed with the crowd. Then he taught the crowd a new chant: “L-W-C-F,” to encourage the U.S. Congress to reauthorize the Land and Water Conservation Fund. The fund uses money – up to $900 million a year, although it’s rarely funded to that level – from offshore oil royalties to buy and maintain public land and parks. The LCWF has provided money for large acreages of Montana’s public lands and parks over the years, including the Legacy forestlands in the Swan Valley. But the funding authorization ended in September and must be renewed. Busse acknowledged the foresight of past leaders who developed the American ideal of public land – Roosevelt, Muir, Mansfield, Metcalf – and praised Montanans who now protect that ideal, including Tester, Bullock and Posewitz. He challenged those attending the rally to support the Habitat Montana program during the 2019 legislative session. Habitat Montana is kind of the state equivalent to the Land and Water Conservation Fund, in that it’s a fund authorized by the Legislature for Fish, Wildlife & Parks to buy public land and conservation easements. Each session, Republican legislators propose bills that would hinder the use of Habitat Montana. “Nowhere else on this globe do people own such a wide swath of natural assets; perhaps the most true living example of equal justice. This land is one of the few places where every man woman and child is equal when they set foot upon that land,” Busse said. Representing a younger generation of advocates, Dropstone Outfitting co-owner Maggie Carr is one of 73,000 Montanans whose jobs depend on public land. Many earn their living as outfitters or guides, a job category that brings in hundreds of millions of tourist dollars to the state, ranking fourth in revenue totals behind fuel, food and lodging. In her case, Carr guides hikers into the Bob Marshall Wilderness and she wants to maintain her lifestyle. But having grown up in Choteau, Carr admitted that she took all the public land out her backdoor for granted until about five years ago when more politicians started calling for the sale of public land. Representing Montana’s Native American communities, Shane Doyle of the Crow Nation sang a Northern Cheyenne honor song before telling the crowd that the idea of public land wasn’t limited to the U.S. government. He told of Chief Plenty Coups, a Crow leader of the mid-1800s, who was so impressed by George Washington’s donation of Mount Vernon to the public that he dedicated his land to the state of Montana. But not everyone champions public land, especially in the current administration. Doyle criticized former Interior Secretary Ryan Zinke for recommending that the Bears Ears National Monument in Utah be dismantled. He called upon Congress to reinstate the monument’s status. While issuing a challenge to the Legislature, Bullock didn’t let the federal government off the hook, saying the shutdown was hurting public land management and the economies of national park gateway communities, like West Yellowstone and Gardiner. He called on the administration and Congress to end it. “Our parks and our public servants are not bargaining chips for policies,” Bullock said. For the past six years when talking about the possibility of public land being sold, Bullock has responded with “Not on my watch.” This time, however, after warning about the threats to public lands that still remain, Bullock changed his mantra just a bit. 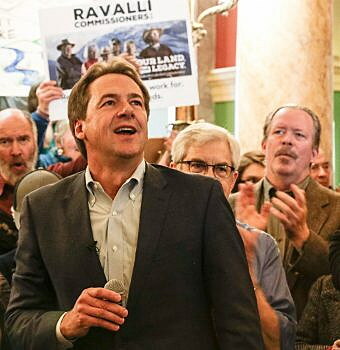 With this being his last Legislature as governor, Bullock added one more thing.